The FURUNO GP33 is the perfect GPS navigator for a wide range of vessels. This advanced unit provides accurate and reliable position fixing, thanks to a super sensitive, 12-channel GPS receiver combined with integrated WAAS technology. Its waterproof display is built to stand up to tough marine conditions. The durable casing houses an impressive memory, capable of storing up to 3,000 points of ship’s track, 10,000 points for marks and waypoints, and 100 routes of up to 30 waypoints each. Vital navigation data is presented on a 4.3" color LCD. The GP33 displays navigation data in a wide variety of numerical and graphical formats. You may freely select which data you want displayed with easy to use controls. The combination of a high resolution screen and large data fields makes the screen easy to read in almost any condition. 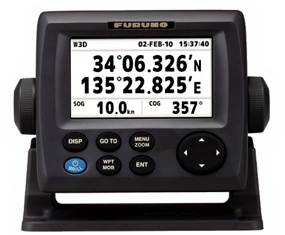 The GP33 features FURUNO’s CAN bus interface system for feeding highly accurate navigation data to your NavNet 3D, radar, chart plotter, autopilot, fish finder or other navigation equipment. CAN bus is a communication protocol that shares multiple data and signals through a single backbone cable. You can simply connect any CAN bus devices onto the backbone cable to expand your network onboard. With CAN bus, IDs are assigned to all the devices, and the status of each sensor in the network can be detected. All the CAN bus devices can be incorporated into the NMEA2000 network, offering easy plug-and-play installation. NMEA0183 protocol versions are also supported.